The parade has started in Wonderland . Everybody is dressed up, the streets are decorated, excitement is in the air. Let's find more people to join the parade. You are one of the organizers of the parade and are constantly trying your best to encourage people to join. If only the people already taking part didn't leave so early... After a short while they simply lose all interest in the parade. And if somebody shows up with the same dress or of higher rank, all they do is leave the parade immediately and complain to you. You just want everybody to have fun, but why is that so difficult? Players play their hand of cards while trying not to get any cards from the parade. Nobody wants points in Wonderland. The start player is determined randomly. Starting with the start player, the game continues clockwise. The start player shuffles the deck and deals each player 5 cards face down. 6 more cards are placed face up next to each other in the middle of the table. These cards are the initial participants of the parade. The game box is placed at one end of the parade to mark the front of the parade. The other side is called the end of the parade. The remaining cards are placed face down as the draw pile in the middle of the table. During his turn, a player performs the following actions in the order given below. Choose one of the cards in your hand and lay it at the end of the parade. If necessary, cards will be removed from the parade and laid in front of the player. Draw a card from the draw pile. The next player performs the same actions during his turn. 1. The player chooses one of the cards in his hand and places it face up at the end of the parade. This card does not count when totaling the number of cards in the next action. 2. Depending on which card is played, some cards have to be removed from the parade. 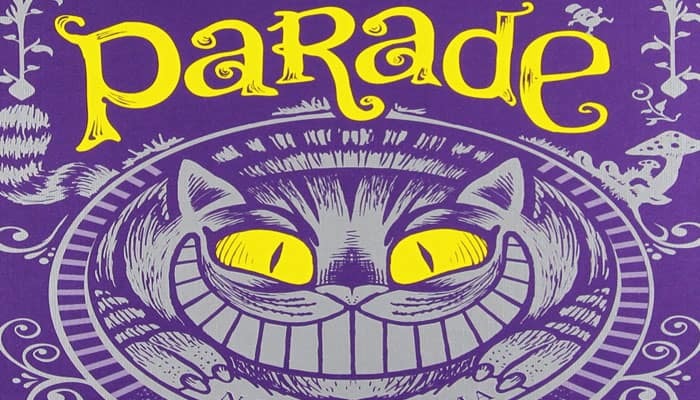 If the number of cards already taking part in the parade is less than or equal to the value of the played card, no cards have to be removed from the parade. If the number of cards already taking part is larger than the value of the played card then some cards might leave the parade. To determine which cards might have to be removed, start numbering the cards from the end of the parade down towards the front, not taking into account the card that was just played. Every card with a position number larger than the value of the played card enters the "removal mode". The removed cards are laid face up and divided into colors in front of the player. The values of all cards must be visible for all players, so it is best to lay them slightly shifted on top of each other. The remaining cards in the parade are moved forward towards the front of the parade to close the gaps. If a card with the value 0 is played, all cards enter removal mode. 3. The player draws a card from the draw pile to replenish his hand to 5 cards. A card (Green-3) is played from the hand and laid at the end of the parade. Since the card value is 3, you ignore the next three cards as they are unaffected by the card that was just played. The remaining four cards are available to be removed and here is what is taken by the player. All cards with the same color as the played card: the Green-0 and Green-7 cards have to be removed. All cards with a value less than or equal to the value of the played card: the Red-3 card has to be removed. Remember, you only remove cards that are in "removal mode". The last round starts when a player has collected cards of all 6 colors, or if the draw pile is exhausted. If a player has collected the 6th color, she finishes her turn as before. After that, every player, including the one who collected the 6th color, plays one more turn. However, the players do not draw a card from the draw pile. The game ends after this last round. If the draw pile is exhausted, every player plays one more turn. The game ends when everybody has only 4 cards left in their hand. Even if other players get their 6th color during the last round, this has no further effect. The games ends after the round. After the end of the game each player chooses 2 cards from their hand and discards them. The remaining 2 cards in hand are added to those already in front of the player. Note: Each of these 2 cards will either be added to colors you already own, or create a new pile (if you do not already have any cards of that color). Only the cards lying in front of a player are scored. The cards still taking part in the parade are discarded. For each color, players must determine the number of points they score. Each color is dealt with separately. Determine who has the majority in each color. The player or players with the most cards in each color flip those cards over and each of these cards counts as 1 point. (The value printed on the cards is not counted). Each player will then add up the printed values of all their face up cards. Sum up this total with the total obtained from any face down cards. 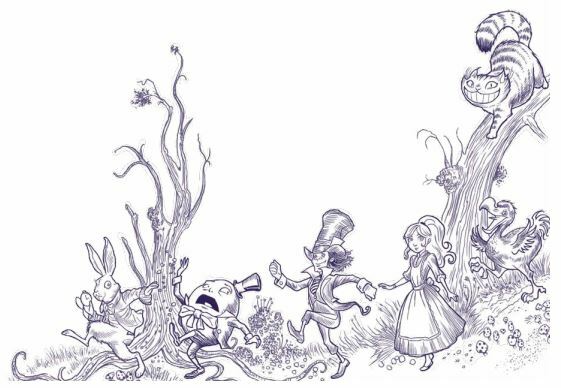 Wonderland, being a little topsy-turvy, the winner is the player with the lowest score. In case of a tie, the tied player with the fewest number of cards in front of herself (flipped and face up) wins the game. The numbers in parentheses () show the value of the cards. 3 Red cards (10, 8, 3), 5 Blue cards (9, 7, 6, 5, 0), 1 Purple card (0), 2 Green cards (4, 2), 3 Grey cards (7, 4, 0). Alice owns the largest number of blue and grey cards. 2 Red cards (1, 0), 1 Blue card (8), 4 Purple cards (8, 7, 5, 3), 3 Grey cards (9, 8, 1), 2 Orange cards (10, 1). The Hatter owns the largest number of purple and grey cards. 4 Red cards(7, 6, 5, 2), 2 Blue cards (4, 3), 2 Purple cards (2, 1), 4 Green cards (9, 8, 7, 6), 1 Grey card (10), 3 Orange cards (3, 2, 0) Cheshire has the majority for the red, green and orange cards. The hatter wins the game. The only rule change is determining majority for scoring purposes. A player has majority only if he has 2 or more cards of a color than the other player.